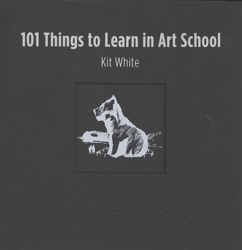 ‘Art can be anything…’ - with a reference point a good as this, Kit White delivers and develops 101 Things to Learn in Art School. Measuring just 150 mm square this small black book does what it says. Inside it, Kit White has given 101 sage maxims to the erstwhile art student. Kit White, a professor of painting at the Pratt Institute, delivers art school lessons with a balance of advice and sage concepts. These 101 maxims offer a repertoire of ideas and a set of guiding principles for the reader. ‘Art can be anything - it is not defined by medium or the means of its production but by a collective sense that it belongs to a category of experience we have come to know as art.’ This is the first of 101 things to learn from this book. Each double page spread features one of the 101 things to learn such as ‘Art is not self-expression’ accompanied by the author’s drawing of a suitable motif. In his introduction, Kit White says art is an idea that belongs to everyone. Some of the lessons have to do with ways of making and representing, but just as many remind us of the necessity of searching, knowing and doubting. Technique, he believes, is an important facet of art education because artists are makers. One has a different view of an image, how it does what it does, if one knows the detail and processes of its creation intimately. He describes quite eloquently the ability to gain new perspectives and the reflection of things discussed. The book is aimed at the art student of whatever discipline and offers a visual correlation to the written thought. As a book its structure is helpful and can be opened anywhere. Each double page spread is thought provoking, aimed at not only Fine Art students but students of any arts discipline; see page 54 on time and media for instance. Kit White delivers on each page an instructive balance between technical advice and concepts. He makes his ideas accessible and applicable. Above all the book gives advice about the issues all artists find across all artistic mediums. It is a guide to using art as a medium for thought. 101. ‘Not every art school graduate becomes a successful artist…’ On a recent radio show in America White said what most of us already know; that art students, through their training, are flexible, adaptable, learn to solve problems and, above all, are imaginative. He stresses that art students are hard workers. Performance and hard work is the key to all of this he says. Each page is thought-provoking. This small book excels at presenting ideas with grace and wit - it is an incisive primer. All art students will find this book will have some relevance to them; 101 things to learn in art school. Mike Caddis is a Consultant to the University of Hull.